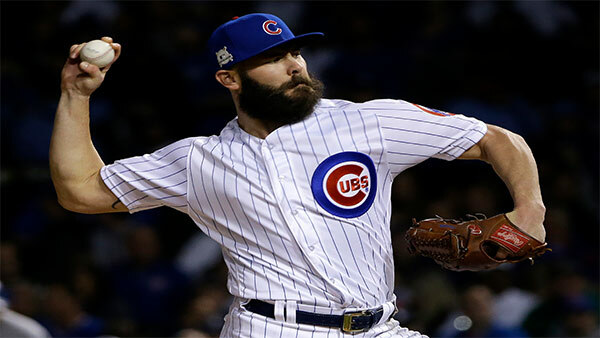 PHILADELPHIA (WPVI) -- The Phillies have signed right-hander Jake Arrieta to a multi-year contract General Manager Matt Klentak announced Monday. Arrieta, 32, went 14-10 with a 3.53 ERA and held opposing hitters to a .235 batting average in 30 starts last year for the Chicago Cubs. In his final 14 starts of the season (beginning July 2), he posted a 2.26 ERA, which was second-best among all major league starting pitchers in that span, trailing only Corey Kluber (1.75; minimum 79.0 innings). Arrieta won National League Pitcher of the Month honors in August after going 4-1 with a 1.21 ERA in six starts. "This is an exciting day for the Phillies organization and our fans," said Klentak. "Jake is among the best pitchers in baseball and his list of accomplishments is exceptional. He is an elite competitor, a tireless worker and a winner, and I am confident that he will be a great addition to our talented young team and the city of Philadelphia." Over the past three seasons (2015-17), Arrieta leads all major league pitchers with 54 wins, ranks second with a 2.71 ERA (Clayton Kershaw - 2.07) and has the third-lowest opponents' batting average (.203). During that time, he pitched two 9.0-inning no-hitters, both as a visiting player: August 30, 2015 against the Los Angeles Dodgers and April 21, 2016 versus the Cincinnati Reds. Also, during those three years, Arrieta had a streak of 24 consecutive starts without a loss that saw him go 20-0 with a 1.01 ERA from July 30, 2015 through May 31, 2016. Arrieta won the 2015 NL Cy Young Award when he went 22-6 with a 1.77 ERA in 33 starts, leading the major leagues in wins, tying for the NL lead in complete games (4), shutouts (3) and starts, and finishing second with 229.0 innings pitched. In 2016, in addition to helping the Cubs win the World Series, he was named to the NL All-Star team and won a Silver Slugger Award after hitting .262 with a .415 slugging percentage. He has five home runs in the regular season and one in the postseason. Originally selected by the Baltimore Orioles in the fifth round of the 2007 June draft out of Texas Christian University, Arrieta is 88-56 (.611) in his career with a 3.57 ERA and .222 opponents' batting average in 197 games (191 starts) for the Orioles (2010-13) and Cubs (2013-17). In nine career postseason starts, he is 5-3 with a 3.08 ERA. To make room for Arrieta on the 40-man roster, the Phillies have designated first baseman Tommy Joseph for assignment. Arrieta will wear number 49.